And I'd never really heard of pinhole cameras before, but from my YouTube searches....seems you can do like medium format film pics with these things. I know it sin't going to be super sharp, but looking at examples, it does look interesting. Does anyone have experience with pinhole cameras in general? Can you give some details on how you use it? You're experiences with it? What size film do you shoot with it? Where do you even BUY film these days....? And...where can you send it to be developed....what is the cost for each? More specifically, does anyone have experience with the ONDU cameras? They look well built and not very $$$. It seems this kickstarted is for an updated version of the ones currently on their website. Anyway, looked like it might be a fun way to experiment with LARGE formats, and play with film. I've got a decent scanner, so I figured I could take the developed negatives and scan them for edits and printing. Looking for some comments and experiences with this type photography if you have some!! You can do a pinhole with any camera. The reason for large formats came about because it used to be that there were no good enlargers, so contact prints were made. If you wanted 11 X 14, you used 11 X 14 film. However, carrying a large format camera and 300 pounds of glass plates around required hired help, and they did not stic around long after their first try at packing the heavy loads around. Camera makers wanted to sell cameras, and that meant making them smaller, and able to capture images in a fraction of a second. Wide aperture lenses were the solution. 120 film was very popular right up into the 1950's, when 35mm gained the upper hand. You can try it with your canon or other brand dslr! There are other brands, this is just a example, I have no opinion about it. At f/222, even IBIS would be worthless. Hmm...so, where does one even BUY film today for things like this? Also, who develops these film negatives? I've seen a couple of YouTubers that have some home developing systems, pouring chemicals into a canister with film and shaking it...I"m not ready to get that manual yet...so, is there a place you can send films like this to get developed into negative you can then scan? First try it with a dslr, film is not necessary, at the very least, you will determine the correct amount of time needed to get a good exposure. Check Walmart and Walgreens if you don't have a local camera store. Mail order to a pro photo developer is best for high quality, you seem to get variable quality from Walmart. Developing B&W film yourself is very easy. Get the tank, developer, and a stop bath, or if you are using sheet film, a tray rather than tank and a very dark room. I'd never really heard of pinhole cameras before, but from my YouTube searches....seems you can do like medium format film pics with these things. I know it sin't going to be super sharp, but looking at examples, it does look interesting. It started off with a whole room, so a very large format. Artists would use a pinhole in an outside wall to project an upside down image on the opposite wall of a room, and they could trace features of it and get things like perspective right, for example. The room needed to be dark, and the Latin term for a dark room was "camera obscura." From that expression we get our word "camera," meaning a photographic device that works on the same principle. 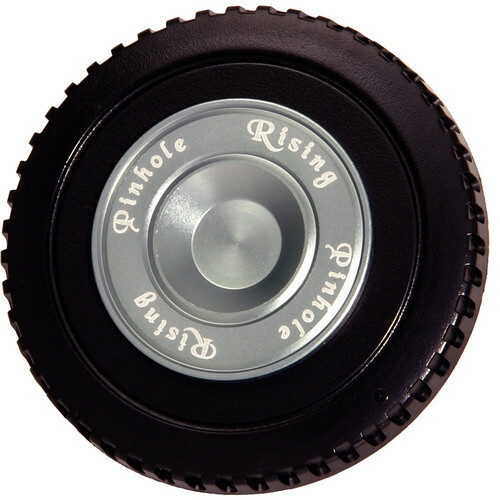 If you haven't guessed already, the pinhole functions as the lens. I've been wanting to drill one of my body caps with a 1/4-inch hole, then attach tinfoil to the front or back of the hole. Get a needle and poke it through. Attach to dSLR body and have at it in LiveView. Redo foil. Try a skinnier needle. Try a bigger needle. I played around in film days with pinhole but the digital feedback loop would be way more fun for me - get the look I want . I was looking into this as much as anything....as a way to step my toe into something of the medium format size or larger without costing myself and arm/leg combo. Interesting stuff here....I may get something and play with it. Try the Holga Pinhole lens before you spend any serious money. It works great on APSC and APSH size sensors but vignettes a fair bit on FF sensors - El Cheapo extension tube will cure this. I find the Holga great and it will help you decide if this is the way you want to go. I ended up getting the ONDU Kickstarter 6x12 Multi-Format pinhole camera. I got it for about $160+ shipping. They also have a little adaptor that will allow you to also use 135 film in the 120 camera. I figured this option gave me the most options to play and learn about this stuff. And it is an interesting, good looking unit. At the very least, even if I don't use it that much, it will look good as a conversation starter on my coffee table which I'd mentioned previously. But I think this will be fun. I've been looking around from links here and just googling, and found some places to buy film and have it developed. I figure I'll just shoot, send off for development, and then scan it myself. If I get into it, I may look into getting one of the little kits with some chemicals and canisters to develop my own film negatives. Dunno how much it costs, but I watched a couple YouTube videos. Developing didn't look like rocket surgery, mostly just a lot of shaking the canisters with the various chemicals. Anyway, I think the kickstarter shuts down in about 11 days or so....so, will be something fun to look forward to coming in the mail next year. Except that this rising pinhole is fun to play around with. and for $30 you can't do much wrong. Any pinhole I have used I have made myself and did not use film but darkroom paper which I dev'd myself. This shot was made from a Beats earphones box and the aperture a needle hole in foil. If you used the Sony headphone box you could of bumped up the DR! Wouldn't it work to put the hole off center, and have the equivalent of a shift lens? Tilt would involve more rigging up, but wouldn't need a lot of precision. I think I'll try the shift version sometime when I run out of anything else to do. That's certainly cheaper than $2,500 if it works. Have fun with the positioning of the paper and the need for a perfectly circular hole. It would be for fun anyway. Distortions might produce some serendipitous results, or maybe just a waste of electrons. Maybe I'll learn something, or maybe I'll just amuse myself for a short while. SO MANY THINGS YOU CAN DO HERE IF YOU ARE PROCESSING YOUR OWN PAPER. (DAMN CAPS) You could construct a box to fit a manual aperture lens in the front and get some optics going. You could make multiple pinholes and create a mosaic image. I love this stuff but when it comes down to it, cyanotypes are my favorite alternative process style. This is so much more fun than the Invariant ISO thread, yuck.